It was inevitable, some folks just can’t stand to be wrong or admit their mistakes but luckily in our modern and hi-tech world, these things can be fixed. I’m talking about the latest in the Eastside name grab debacle. You remember all those poor confounded souls, new arrivals, Echo Park hipsters and journalists who somehow believed neighborhoods west of the Los Angeles River were part of the Eastside. The Eastside issue is a moot point now, discussion and debate are needless. 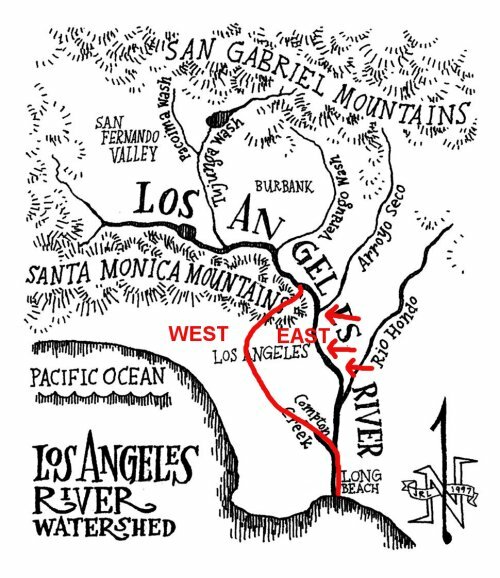 Thanks to articles in the Los Angeles Times and the numerous posts on this here site, EVERYONE knows where the Eastside begins: East of the Los Angeles River. However, some folks are not so easily deterred, oh no! Some people will stick by their story, even when they are so very wrong. They’ve told us: “History and geography in Los Angeles are fluid” “Eastside east of the river? Essentialists!” and other cute put-downs created to entertain the post-modern sense of wit so popular with residents of hip neighborhoods. The problem is they know they were wrong but have grown tired of deflecting the truth. So they put their resources together, gathered their connections and called in favors to make things right. That’s how it’s been done in the past – contracts, paperwork, legalese and the proper connections have always made things “right” for the privileged in this country, so why let a little thing like geography stop them? The solution was simple: make the west, east! According secret documents spirited to LA Eastside headquarters in Lincoln Heights, the Army Corps of Engineers at the behest of city leaders, influential donors and a coalition of stubborn hipsters, is planning to move the path of the Los Angeles River further west so Echo Park, Silver Lake and bits of Hollywood will now be located east of the river. It’s actually an idea that’s been floating around city hall and various chamber of commerces for many years now. You see, many politicians and business people have realized the potential of riverside development. You know, cafes, boutiques, recreation, high-end condos – all their values enhanced by the flowy vista of our mighty (well, for two months out of the year) Los Angeles River. The problem was, no one wanted to make those kinds of investments in our neighborhoods. We weren’t worthy. By moving the river west, their moneyed demographics are already in place. Add to that the desire for the hip residents to be edgy and eastsidery and it’s a win-win situation…for them. The exact location of the river has yet to be determined but due to various lobbying groups it must go west of the Silver Lake junction and Vermont. Some in the newly gentrified Fairfax district (where I first encountered the poorly named Eastside Shopping Guide) hoped it would make it as far west as their area but unfortunately geologists said it might interfere with ongoing archaeological work at The La Brea Tar Pits (the park named by the bilingual stutterer). You can be assured though, this will happen. The proper connections, influence and money will get you whatever you want in this city – good sense, history and fairness be damned. This entry was posted in East Los, Geography, Greater Los Angeles, Pendejadas by chimatli. Bookmark the permalink. You know the LA river has changed paths many times naturally- changing directions near downtown to go out the Ballona wetlands or down to Long Beach. It was solidified into its current path by the Army Corps of Engineers in the 1930\’s, and it looks like according to your post, it was moved once more near the turn of the 21st century by the real estate industry. Regardless of where they move the river, we all know where the eastside is. I say we make a new line of demarcation to show anywhere east of downtown is the eastside. These people want to claim the eastside, then let them move to the real eastside. I grew up on the westside but have lived in NELA the last 5 years. I don’t claim eastside, so neither should these annoying ‘gentrifiers’. I don’t think eric garcetti will go for it. His district’s proximity to the real eastside makes him appear a little more “edgy”- an image his people think will help get him to the mayor’s office. Tom labonge has a different dilema- although rio-realignment negatively affects part of his district, a large portion of it will benefit. Long sought after geographical legitimacy vs. the massive ecological impact of moving the damn river. Thanks all for the enjoyable and humorous comments! Chris, we’ve always said ‘east of the river’ to make things easy but technically the Eastside has been the neighborhoods directly adjoining Downtown to the east. Lincoln Heights was historically considered the Eastside although many realized it was northeast. In recent times, many folks only considered Boyle Heights the Eastside so I guess it depends on who you ask. But we all know it ain’t Echo Park or Silver Lake! Joking aside, does anyone remember when they proposed the LA River be turned into a freeway? I could see if they would be specific as to just where they think Echo Park is on the “east side” of. Obviously, the people who came up with this are in or around Hollywood. So why don’t they just say East Hollywood? To call Echo Park and Silver Lake the east side is a bit grand, considering even further to the east is the central downtown of the second largest city in the nation, which these neighborhoods are clearly on the northwest side of. Could this be part of an agenda to separate Hollywood from Los Angeles, and that those behind it (and a shill or two of theirs in the press) are trying to stake an early claim on Echo Park and Silver Lake? Does this mean Manuel will be moving El Tepeyac to Silverlake? That’s too far for me to drive with a Sunday morning hangover!!! !